Mother’s Day celebrations are incomplete without gifts. This 12th May gift your mom something she will cherish for a long time. Send perfumes, gift hampers, cakes, soft toys, spa baskets or fruit baskets to show how much you love your mom. Our gifts are delivered Same Day or Next Day through our network of local gift shops. Remember to place your order before-hand so as to get your gift delivered on or before Mother’s Day and to avoid last minute delays. Send flowers same day to United Kingdom using our local florists & flower shops. Order by 12 noon. 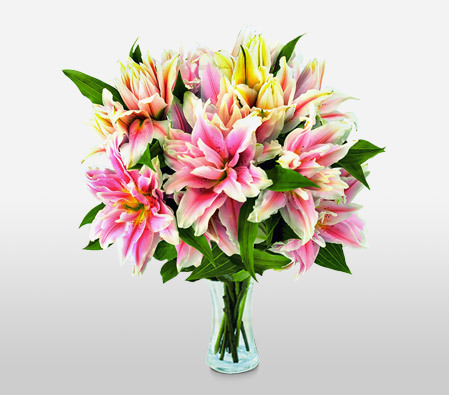 Send Mother's Day Pink Roses, Lilies, Carnations & Special Gifts to United Kingdom. Send Roses, Carnations, Lilies throughout United Kingdom for occasions like Birthdays, Anniversaries, Funerals, etc. Enjoy affordable flower delivery across London, Birmingham, Manchester, Sheffield & nationwide delivery. Roselily is a perfect blend of two exceptional flowers. These Rare flowers have a phenomenal fragrance, and they are long-lasting. This is the perfect bunch of beauties to send if you really want an impressive and memorable gift! We at Flora2000 bring together elegant designs, guaranteed on time flower delivery, personal care, and the finest quality to offer you luxurious floral arrangements for those special occasions. Send flowers to UK and make special occasions even more memorable for your loved ones by delighting them with enchanting ensembles. You can rely on us to send flowers online across UK from London to Glasgow or Birmingham to Leeds by choosing something stunning from our lavish collection of bouquets and exquisite gifts. How do i send International Flower Delivery to United Kingdom? 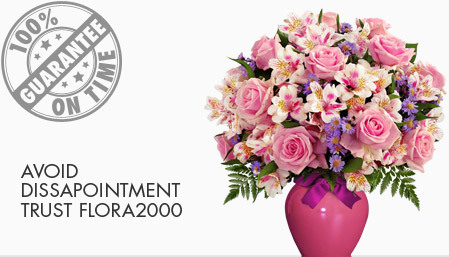 Flora2000 has transformed International flower delivery to United Kingdom into a fine and effortless art. With our efficient flowers & gifs delivery services worldwide; you are sure to find the perfect expression of your message to your loved ones. Be it Roses, Lilies, Carnations or Cakes, our gifts are sure to make both the sender and the receiver happy. We make sure the gifts you give reflects what you feel about the receiver. UK is a developed country and also holds the fifth largest fifth-largest economy by nominal GDP. London is not only a global city but also financial centre with an urban area population of 10.3 million. Gifting in UK is considered to be vital by British people. Flower gifting is carried on a very large scale in cities like London, Edinburgh, Bath, Glasgow, Manchester, Liverpool contribute majorly in flower business. Flowers, Cakes, chocolates, clothes, jewellery and electronic gadgets are the most preferred gifts. Roses, Lilies, Tulip, Daffodil, Sunflower, Orchid. Carnation and Bluebell being the most gifted flowers in UK. if someone invites you to his home don’t forget to carry flowers along. However, make sure that you don’t bring lilies, as they are a symbol of death. Another common tradition – particularly at weddings is that the bride carries flowers, as it is believed that it will not only ward off evil spirits but will ensure fertility. Another tradition is that gifting flowers should be in odd numbers, but make sure that thirteen flowers are never presented, as it is an extremely inauspicious number. white lilies considered to be sympathy flowers. Handpicked Unique Gift Ideas for Mom. Fresh Roses, Lilies, Carnation & Gift Hampers specially crafted for your mum. Order NOW for guaranteed delivery on Mother’s day in United Kingdom.